WELCOME TO ARTISTS UNITED FOR CHRIST, INC.
We welcome you to our website. Please use the menu bar for more information about our organization. There is always a story behind a painting. We will share two of them concerning the artwork above. 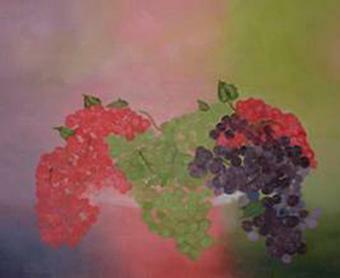 The painting to your left above is titled "Thank You Grapes". It was painted by students between the ages of five and eleven years old. These young artists were students of the NHP Foundation Workshops. We transported the painting to Dallas, Duncanville and Arlington, Texas to allow each child an opportunity to participate in this project. We delegated painting the red grapes to our Dallas students, the green grapes to Duncanville and the purple to our Arlington students. The leaves, stems and detailing were assigned to our advanced students. 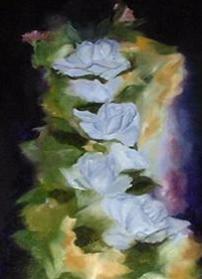 The blending of the background was assigned to our young artists with the gift of blending. This was a fun assignment and our way to say thank you to the Meadows Foundation. This painting now hangs at the Meadows Corporate office in Dallas, Texas. This project was requested by Lynnette Barton. 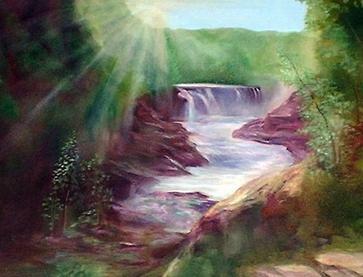 The painting, Protected Valley to your upper right was executed by Gwen Pruitt Davis, art instructor. It has two hound dogs lying down side by side in the foreground. Our students are taught the importance of listening and observation. The dogs are protecting the valley. Can you find them? Contact me with the correct location of the dogs to receive a discount to one of our classes. Proceeds will be donated to the Amazingly Gifted Youth Fine Art Workshops.